In the name of God, One in the Holy Trinity. Stanislaw August, by the grace of God and the will of the people King of Poland and Grand Duke of Lithuania, Ruthenia, Prussia, Mazowsze, Zmudz [Samogitia], Kiev, Wolyn, Podole, Podlasie, Livonia, Smolensk, Sever and Czernihov; together with the confederated estates in dual number representing the Polish people. Recognizing that the destiny of us all depends solely upon the establishment and perfection of a national constitution, having by long experience learned the inveterate faults of our government, and desiring to take advantage of the season in which Europe finds itself and of this dying moment that has restored us to ourselves, free of the ignominious dictates of foreign coercion, holding dearer than life, than personal happiness the political existence, external independence and internal liberty of the people whose destiny is entrusted to our hands, desiring as well to merit the blessing and gratitude of contemporary and future generations, despite obstacles that may cause passion in us, do for the general welfare, for the establishment of liberty, for the preservation of our country and its borders, with the utmost constancy of spirit ordain the present constitution and declare it to be entirely sacred and inviolable until the people, at the time by law prescribe, by their clear will recognize a need to alter it in any of its articles. To which constitution the further statutes of the present seym shall apply in everything. The dominant national religion is and shall be the sacred Roman Catholic faith with all its laws. Passage from the dominant religion to any other confession is forbidden under penalties of apostasy. Inasmuch as the same holy faith bids us love our neighbors, we owe to all persons, of whatever persuasion, peace in their faith ad the protection of the government, and therefore we guarantee freedom to all rites and religions in the Polish lands, in accordance with the laws of the land. Reverencing the memory of our ancestors as the founders of a free government, we most solemnly assure to the noble estate all liberties, freedoms, and prerogatives of precedence in private and public life, and more particularly we confirm, assure and recognize as inviolable the rights, statutes and privileges justly and lawfully granted to that estate by Kazimierz the Great, Louis the Hungarian, Wtadyslaw Jagiello and his brother Witold, Grand Duke of Lithuania, and no less those by Wladyslaw the Jagiellonian and Kazimierz the Jagiellonian, by Jan Albert, the brothers Alexander and Zygmunt the First, and by Zygmunt August, the last of the Jagiellonian line. We acknowledge the dignity of the noble estate in Poland as equal to any degree of nobility used anywhere. We recognize all the nobility to be equal among themselves, not only in seeking for offices and for the discharge of services to the country that bring honor, fame or profit, but also in the equal enjoyment of the privileges and prerogatives to which the noble estate is entitled. Above all, we desire to preserve and do preserve sacred and intact the rights to personal security, to personal liberty, and to property, landed and movable, even as they have been the tide of all from time immemorial; affirming most solemnly that we shall permit no change or exception in law against anyone's property, and that the supreme national authority and the government instituted by it shall lay no claims to any citizen's property in part or in whole under pretext of jurium regalium (royal rights) or any other pretext whatever. Wherefore we do respect, assure and confirm the personal security of, and all property by rights belonging to, anyone, as the true bond of society, as the pupil of civil liberty, and we desire that they remain respected, ensured and inviolate for all time to come. We recognize the nobility as the foremost defenders of liberty and of the present constitution. We charge unto the virtue, citizenship and honor of every nobleman the reverence of its sanctity and the safeguarding of ii durability, as the sole bulwark of the country and of our liberties. We desire to maintain in its entirety, and declare to be part of the present constitution, the law passed at the present seym under the title, "Our free Royal Cities in the states of the Republic," as a law that provides new, genuine and effective force to the free Polish nobility for the security of their liberties and the integrity of our common country. Both from justice, humanity and Christian duty, as from our own self-interest properly understood, we accept under the protection of the law and of the national government the agricultural folk, from under whose hand flows the most copious source of the country's wealth, and who constitute the rnost numerous populace in the nation and hence the greatest strength of the country, and we determine that henceforth whatever liberties, assignments or agreements squires authentically agree to with peasants of their estates, whether those liberties, assignmeni and agreements be done with groups or with individual inhabitants of a village, shall constitute a mutual obligation, in accordance with the true sense of the conditions and provisions contained in such assignments and agreements, subject to the protection of the national government. Such agreements and the obligations proceeding therefrom, freely accepted by a landowner, shall so bind not only him but also his successors or purchasers of the right, that they shall never arbitrarily alter them. Likewise peasants, of whatever estate, shall not withdraw from agreements freely entered into, or from assignments accepted, or from duties therewith connected, except in such manner and with such conditions as stipulated in the provisions of said agreemeni, which, whether adopted in perpetuity or for a limited time, shall be stricdy binding upon them. Having thus guaranteed squires in all profits due them from the peasants, and desiring as effectively as possible to encourage the multiplication of the people, we declare complete freedom to all persons, both those newly arriving and those who, having removed from the country, now desire to return to their native land, insofar as every person newly arrived from any part, or returning, to the states of the Republic, as soon as he set foot upon Polish soil is completely free to use his industry as and where he will, is free to make agreements for settlement, wages or rents as and to such time as he agree, is free to settle in city or countryside, and is free to reside in Poland or to return to whichever country he wish; having previously acquitted such obligations as he had freely taken upon himself. All authority in human society takes its origin in the will of the people. Therefore, that the integrity of the states, civil liberty, and social order remain forever in equal balance, the government of the Polish nation ought to, and by the will of the present law forever shall, comprise three authorities, to wit, a legislative authority in the assembled estates, a supreme executive authority in a king and guardianship, and a judicial authority in jurisdictions to that end instituted or to be instituted. The chamber of deputies, as the image and repository of national sovereignty, shall be the temple of legislation. Therefore all bills shall be decided first in the chamber of deputies. Primo. As to general laws, that is, constitutional, civil, criminal, or for the institution of perpetual taxes: in which matters proposals submitted by the throne to the provinces (wojewodztwa), lands (ziemie) and counties (powiaty) for discussion, and by instructions coming to the chamber, shall be taken for decision first. Secundo. As to resolutions of the sejm, that is, temporary levies, degree of coin, contraction of public debt, ennoblement or other incidental rewards, disposition of public expenditures ordinary or extraordinary, war, peace, final ratification of treaties of alliance or trade, any diplomatic acts or agreements involving the law of nations, the quitting of executive magistracies, and like matters corresponding to the chief national needs, in which matters proposals from the throne shall come directly to the chamber of deputies and shall have priority of procedure. Primo. To adopt, or to retain for further deliberation by the nation, by the majority vote provided in law, every law which, having formally passed the chamber of deputies, shall be immediately forwarded to the senate; adoption shall confer the force and sanctity of law; retention shall only suspend a law suspended by the senate shall be adopted. Secundo. To decide every resolution of the sejm in the above enumerated matters, which the chamber of deputies shall immediately send to the senate, together with the chamber of deputies by majority vote, and the conjoint majority, provided by law, of both chambers shall be the judgment and will of the estates. We stipulate that senators and ministers shall not have a votum decisivum (decisive vote) in the sejm in matters concerning their conduct of office, either in the guardianship or in commission, and at such time shall have a seat in the senate only to give explication upon demand of the sejm. An ever ready sejm shall be legislative and ordinary. It shall begin every two yea and shall last as provided in the law on sejms. Ready, convoked in exigencies, it shall decide only about the matter in which it be convoked, or about an exigency befallen after it be convoked. No law shall be abrogated at the ordinary sejm at which it has been enacted. A sejm shall comprise the number of persons provided by lower law, both in the chamber of deputies and in the chamber of senators. We solemnly confirm the law on regional sejms, enacted at the present sejm, as a most essential foundation of civil liberty. Inasmuch as legislation cannot be conducted by all, and the nation to that end employs as agents its freely elected representatives, or deputies, we determine that deputies elected at the regional sejms shall, in legislation and in general needs of the nation, be considered under the present constitution as representatives of the entire nation, being the repository of the general confidence. Everything, everywhere, shall be decided by majority vote; therefore we abolish forever the liberum veto, confederations of any kind, and confederate sejms, as being opposed to the spirit of the present constitution, subversive of government, and destructive of society. Preventing on one hand abrvpt and frequent changes of national constitution, and on the other recognizing the need to perfect it after experiencing its effect upon the public weal, we designate a season and time for review and amendment of the constitution every twenty-five yea, desiring that such a constitutional sejm be extraordinary in accordance with the provisions of a separate law. No government, be it the most perfect, can stand without strong executive authority. The happiness of the people depends upon just laws, the effect of the laws upon their execution. Experience teaches that neglect of this part of government has filled Poland with misfortunes. 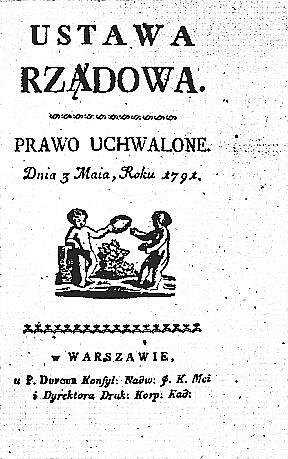 Therefore, having reserved unto the free Polish people the authority to make laws for itself and the poser to keep watch upon all executive authority, as well as to elect officials to magistracies, we confer the authority of supreme execution of the laws to the king in his council, which council shall be called the guardianship of the laws. The executive authority is strictly bound to observe the laws ad to carry them out. It shall act of itself, the laws permitting, where the laws need supervision of execution, or even forceful aid. Obedience is owed to it always by all magistracies; we leave in ii had the power to press magistracies that be disobedient or remiss in their duties. The executive, authority shall not enact or interpret laws, impose levies by any name, contract public debts, alter the distribution of treasury revenues established by the sejm, wage war, or definitive (definitively) conclude peace or treaties or any diplomatic act. It shall be free to conduct only interim negotiations with foreign states, and to take, temporary and current measures requisite for the security and peace of the country, of which it shall inform the next assembly of the sejm. We desire and determine that the throne of Poland shall be forever elective by families. Disastrous experience of interregnums periodically overturning the government, the obligation to safeguard every inhabitant of the Polish land, the sealing forever of avenue to the influences of foreign powers, the memory of the former grandeur and happiness of our country under continuously reigning families, the need to turn foreigners away from ambition for the throne, and to turn powerful Poles toward the single-minded cultivation of national liberty, having indicated to our prudence that the throne of Poland be passed on by right of succession. 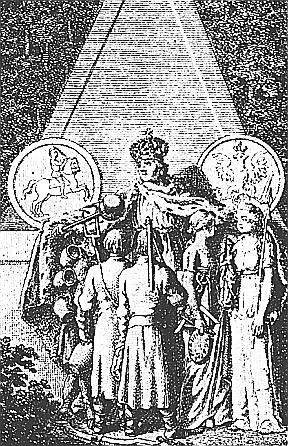 We determine, therefore, that following the life that Divine beneficence shall grant to us, the present-day elector of Saxony shall begin with the person of Frederick Augustus, present-day elector of Saxony, to whose male successors de lumbis (from the loins) we reserve the throne of Poland. Should the present-day elector of Saxony have no male issue, then the consort, with the consent of the assembled estates, selected by the elector for his daughter shall begin the male line of succession to the throne of Poland. Wherefore we declare Maria Augusta Nepomucena, daughter of the elector, to be infanta of Poland, reserving to the people the right, which shall be subject to no prescription, to elect another house to the throne after the expiration of the first. Every king, when ascending the throne, shall execute an oath to God and to the nation, that he will preserve the present constitution and the pacta conventa15 that shall be drawn up with the present-day elector of Saxony, as destined to the throne, and which shall bind him as shall those of the past. The person of the king is sacred and secure from everything. Doing nothing of himself, he shall be answerable for nothing to the nation. He shall not be autocrat but father and chief of the nation, and as such the present law and constitution deems and declares him to be. The incomes as they shalt be provided for in the pacta conventa, and the prerogatives proper to the throne as stipulated by the present constitution to the future elect, shall not be touched. All public acts, tribunals, courts of law, magistracies, coin and stamps shall go under the king's name. The king, to whom shall be left every power of beneficence, shall have ius agratiandi (the right to pardon) those sentenced to death, except in criminibus stati's (in crimes of state). To the king shall belong the supreme disposition of the country's armed forces in wartime and the appointment of army commanders, howbeit with their free change by the will of the nation. It shall be his duty to commission officers and appoint officials pursuant to the provisions of lower law, to appoint bishops and senators persuant to the provisions of that law, and ministers, as the prime officials of the executive authority. Primo the primate, as chief of the Polish clergy and as president of the educational commission, who may substitute for himself in the guardianship the first bishop ex ordine (in rank), neither of whom shall sign resolutions; secundo five ministers, to wit: a minister of police, a minister of the seal, a minister be Iii (of war), a minister of the treasury, and a minister of foreign affairs; tertio two secretaries, of whom one shall keep the protocol of the guardianship, the other the protocol of foreign affairs, both without a decisive votum. The successor the throne, having emerged from minority and executed an oath to uphold the constitution, may be present at all sessions of the guardianship, but without a vote. Primo. In an exigency involving the law of nations, more particularly in the event of war hard by the borders. Secundo. In the event of internal disorder that threatens revolution in the country or collision between magistracies. Tertio. In evident danger, generally voiced. Quarto. In the country's bereavement by death of the king, or in his dangerous illness. All resolutions in the guardianship shall be discussed by the above- mentioned body of persons, and the royal decision shall prevail after all opinions have been heard, that there be a single will in the execution of law; therefore every resolution from the guardianship shall issue under the king's name and with the signature of his hand, but it shall also be signed by one of the ministers seated in the guardianship, and thus signed, it shall oblige obedience, and shall be carried out by the commissions or by any executive magistracies, but particularly in such matters as are not explicilly excluded by the present law. In the event that none of the seated ministers wish to sign the decision, the King shall abandon the decision, but should he persist in it, the marshal of the sejm shall request convocation of the ready sejm; and if the king delay convocation, the marshal shall convoke it. Even as to appointment of all ministers, so also is it the king's right to summon one of them from every department of administration to his council, or guardianship. This summoning of a minister to sit in the guardianship shall be for two yea, as now with the king's free confirmation of it. Ministers summoned to the guardianship shall not sit in commissions. In the event that a two-third majority of secret votes of the two conjoint chambers of the sejm demand change of a minister either in the guardianship or in an office, the king shall immediately appoint another in his place. Desiring that the guardianship of the national laws be bound to strict accountability to the nation for any and all its misdeeds, we determine that, when ministers be charged with breach of law by a deputation designated to examine their deeds, they shall answer in their own persons and property. In any such impeachments, the assembled estates shall by simple majority vote of the conjoint chambers send the inculpated ministers to sejm courts for their just punishment equalling the crime or, their innocence being demonstrated, their release from proceedings and punishment. Primo of education, secundo of police, tertio of the army, quarto of the treasury. The provincial (wojewodzkie) commissions of order instituted at this sejm, also subject to the supervision of the guardianship, shall receive orders through the above-mentioned intermediary commissions, respective(ly) as to the objects of the authority and obligations of each of them. The judicial authority shall not be carried out either by the legislative authority or by the king, but by magistracies instituted and elected to that end. And it shall be so bound to places, that every man shall find justice close by, that the criminal shall see everywhere over him the formidable hand of the national government. Primo. Courts of first instance for every province (wojewodztwo), land (ziemia) and country (powiat), to which judges shall be elected at regional sejms. The courts of frrst instance shall be ever ready and vigilant to render justice to those in need of it. From these courts, appeal shall go to chief tribunals for every province (prowincja), to be established, comprising also persons elected at regional sejms. And these courts, both of first and of last instances, shall be land courts (sady ziemskie) for the nobility and for all landowners in causis juris et facti (in matters of law and fact with anyone). Secundo. We secure judicial jurisdictions to all cities, pursuant to the law of the present sejm on the free royal cities. Tertio. We shall have separate referendary courts for each province (prowincja) in matters of free peasants under former laws subject to this curt. Quarto. We preserve chancery, assessorial, relational and Kurlandian courts. Quinto. The executive commissions shall have courts in matters pertinent to their administration. Sexto. In addition to courts in civil and criminal matters for all the estates, there shall be a supreme court, called a sejm court, to which persons shall be elected at the opening of every sejm. To this court shall be subject crimes against the nation and the king, or crimina status (crimes of state). We command that a new code of civil and criminal laws be drawn up by persons designated by the sejm. Primo during the king's minority. Secundo during an infirmity causing permanent mental alienaton. Tertio in the event that the king be taken in war. Minority shall last only until eighteen years of age; and infirmity respecting permanent alienation shall not be declared except by a ready sejm, by majority vote of three parts against the fourth of the conjoint chambers. In these three cases, the primate of the Polish Crown shall immediately convoke the sejm, and if the primate be slow in this obligation, the marshal of the sejm shall issue circular letters to the deputies and senators. 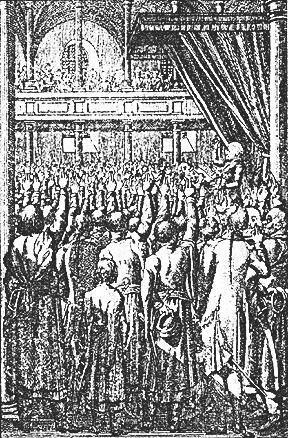 The ready sejm shall arrange the order of seating of the ministers in the regency and shall empower the queentotike the place of the king in his duties. 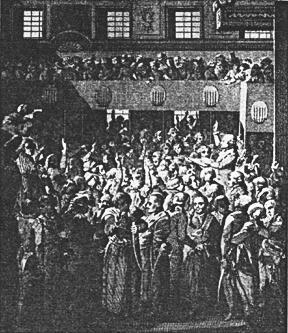 And when the king in the first case emerge from minority, in the second come to complete health, in the third return from captivity, the regency shall tender him account of its deeds and answer to the nation for the time of its office, even as is prescribed of the guardianship at every ordinary sejm, in their own persons and property. Royal sons, whom the constitution destines for succession to the throne, are the first sons of the nation, wherefore attention to their good education is a concern of the nation, without prejudice, however, to parental rights. Under the government of the king, the king himself, together with the guardianship and with a supervisor of the education of the king's sons designated by the estates, shall see to their education. Under the government of a regency, the regency, together with the aforementioned supervisor, shall have the education of the kings's sons entrusted to them. In either case, the supervisor designated by the estates shall inform every ordinary sejm about the education and conduct of the royal sons for confirmation by the sejm, so that in their education uniform rules continually and early instill in the minds of future successors to the throne religion and love of virtue, country, liberty and the national constitution. The nation bears a duty to its own defense from attack and for the safeguarding of its integrity. Therefore all citizens are defenders of the national integrity and liberties. The army is nought but a defensive force drawn and ordered from the general force of the nation. The nation owes reward and esteem to its army because the army dedicates itself solely to the nation's defense. It is the army's duty to protect the nation's borders and general peace, in a word, to be its strongest shield. That it fulfill this destiny unfailingly, it shall remain always in obedience to the executive authority, in accordance with the provisions of law, and shall execute an oath of fidelity to the nation and to the king and to the defense of the national constitution. Thus the national army may be used for the general defense of the country, for the safeguarding of fortresses and borders, or in aid of law, if any not be obedient to its execution. Stanislaw Nalecz Malachowski, referendarz wielki koronny, sejmowy i konfederacji prowincji koronnych marszalek. Kazimierz ksiaze Sapieha, general artylerii litewskiej, marszalek konfederacji Wielkiego Ksiestwa Litewskiego. Jozef Korwin Kossakowski, biskup inflancki i kurlandzki, nastepca koaudiutor biskupstwa wilenskiego, jako deputowany. Antoni ksiaze Jablonowski, kasztelan krakowski, deputat z Senatu Malej Polski. Symeon Kazimierz Szydlowski, kasztelan zarnowski, deputowany z Senatu prowincji malopolskiej. Kazimierz Konstanty Plater, kasztelan generala trockiego, deputowany do konstytucji z Senatu Wielkiego Ksiestwa Litewskiego. Walerian Stroynowski, podkomorzy buski, posel wolynski, z Malopolski deputat do konstytucji. Stanislaw Kostka Potocki, posel lubelski, deputowany do konstytucji z prowincji malopolskiej. Jan Nepomucen Zboinski, posel ziemi dobrzynskiej, deputowany do kosntytucji z prowincji wielkopolskiej. Tomasz Nowowiejski, lowczy i posel ziemi wyszogrodzkiej, deputowany do konstytucji. Jozef Radzicki, podkomorzy i posel ziemi zakroczymskiej, deputowany do konstytucji z prowincji wielkopolskiej. Jozef Zabiello, posel z Ksiestwa Zmudzkiego, deputowany do konstytucji. Jacek Puttkamer, posel wojewodztwa minskiego, deputowany do konstytucji z prowincji Wielkiego Ksiestwa Litewskiego. Columbia University Press, 1990, 252 p.
Konstytucja PRL po zmianach z 1976 r.
Polskie Wydawnictwo Naukowe, Warszawa, 1981, 301 p.
Foundation for Foreign Affairs, Washington, D.C., 1950, 114 p.
Warsaw Polish Commission for International Law Cooperation, Warsaw, 1935, 47p. Irish Free State Constitution Commission, 1922, 604 p.
Doubleday, Page & Co., 1922, 612 p.
Wydawnictwo Lubelskie, Lublin, 1981, 84 p.
based on the Polish text published in Piotrkow, Poland, in 1915. It was originally published in PNCC Studies, Vol. 3 (1982).